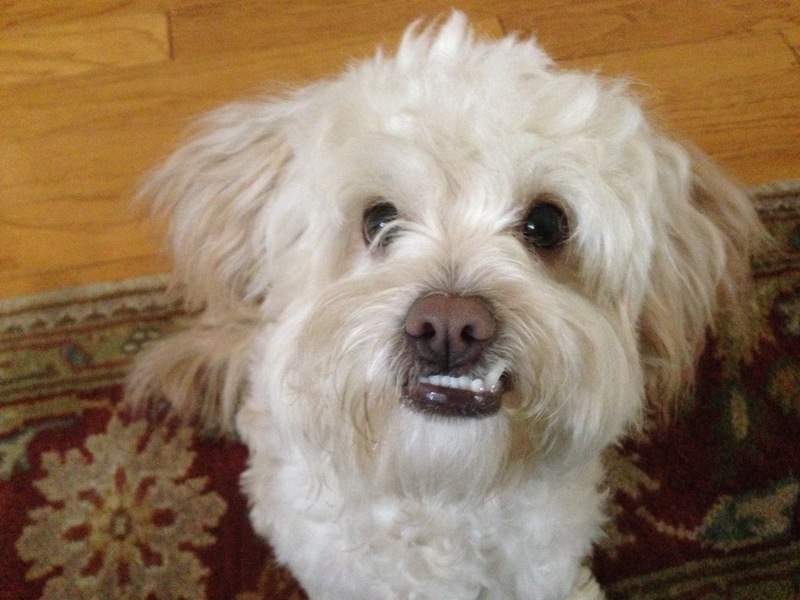 Hope is a six-month-old ChiPoodle in Mission Viejo, California who is a picky eater, mouths and nips his family members, steals things and gets so over excited he urinates at times. When I arrived for the session, Hope was pretty excited so I ignored him. When you have a dog that urinates when it gets too excited, one of the best things you can do is not engage or provide any attention until the dog settles down. The urination is a completely involuntary reflex that comes from the dog being over stimulated. I explained this to his owner along with a few other tips to help keep little puddles from happening in the future. 1) Only pet the dog when it is completely calm. 3) Taking the dog outside to potty prior to anyone arriving. The less urine in the bladder, the leads pressure builds up which helps the dog keep accidents from happening. 4) Teaching the dog to stay several feet from the door to the home when people arrive. The distance helps a dog from getting over excited. To help Hope learn some self control, I went over some rules and boundaries his guardians can implement. This structure can help the dog develop some self discipline which will go a long ways towards eliminating his accidents. Next I had one of his family members step outside so she could pretend to be a guest arriving so I could show them a new way of answering the door. When you have a dog that barks when people knock, its natural to want to get up and to the door quickly hoping this will stop the barking. But instead the dog learns it can motivate its guardian to move faster by barking. For this reason I got up to answer the door in a calm manner. I didnt walk slowly, but I didnt rush either. Once I got to the door I turned to face the dog placing the door behind me. Standing up and facing a dog is the most commanding or authoritative position a human can adopt to a dog (This technique should not be used for an aggressive or dominant dog). As soon as I was facing the dog, Hope paused for a moment, then tried to go around me to get to the door. As soon as he did this I made a loud hissing sound while taking a sudden, deliberate step towards the dog. The combination of the sound and movement caused Hope to take a step back and stopped the barking. I kept walking towards the dog until it was 7 feet away from the door. Meanwhile the family member was knocking and ringing the doorbell the entire time. Once I moved the dog back to where I wanted it (a respectable distance from the door), I took one step backwards towards the door keeping my front facing the dog. When I did this, Hope took a step forward so I did the same, stepping directly at the dog while making the hissing sound again. We repeated this back and forth movement until the dog stopped moving forward to the door. Once I was able to walk backwards to reach the door, I kept my eyes and front facing the dog while i reached behind me to giggle the door knob. This is a trigger that caused Hope to come forward again. As soon as he started to move forward, I made the sound and stepped right at him to communicate that I disagreed with his attempt to reach the door. I repeated this process three times before Hope stayed in place when I jiggled the door handle and finally opened the door. I suggested his owners repeat this exercise a few times a day with members of the family to help Hope develop a new way of acting when people knock at the door. Combined with the rules and structure we went over earlier, Hope will learn to stop getting so excited when things he likes happen. Once this is the case, his days of excited accidents and stealing things for attention will stop.